My daughter Abbie is one lucky little girl for a lot of reasons, but one of them is that she has lots of aunts and uncles. I have never been close to my aunts and uncles, so these relationships are some of my favorite to watch. One of the best relationships is the one Abbie has with my sister Rachel. Rachel was born when I was 9 years old, the sister I asked for and waited for since I knew what a sibling was. She was perfect in every way to me, and still is. The most perfect part about her? She has Asperger’s syndrome, and she’s someone I learn from every day. 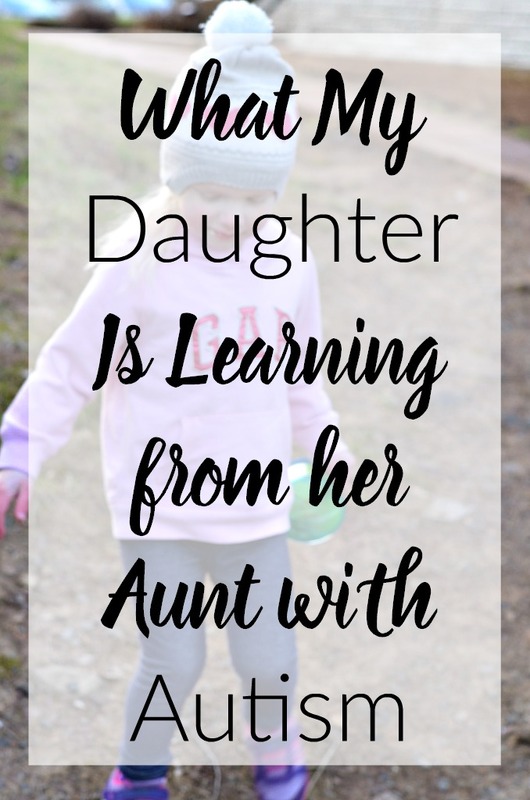 Nowadays, I’m not the only one learning from her – Abbie is learning invaluable lessons too. In honor of Autism Awareness month, I wanted to share a few. First, she’s learning to have patience. If you’ve ever met someone on the autism spectrum, you know they can have challenging personalities, and my sister is no different. Sometimes she’s difficult. Sometimes she latches on to something and won’t let go – and all you can do is be patient with her and try to address what she needs and what she’s feeling. 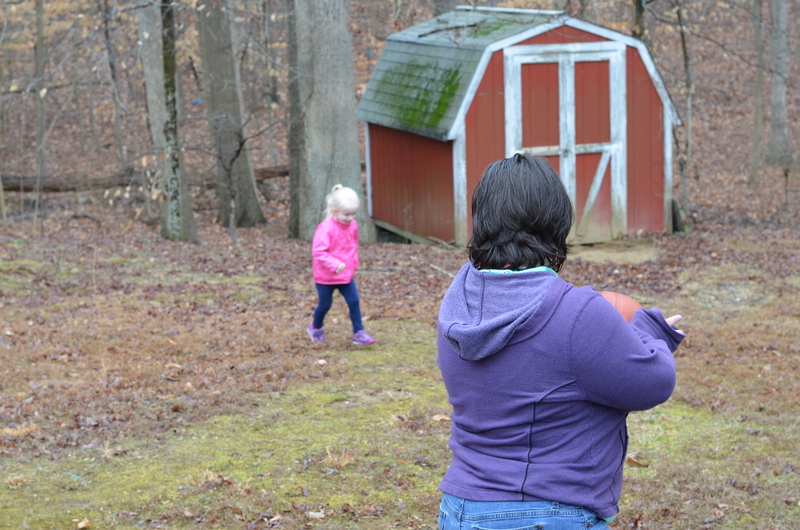 By being around her, Abbie is learning how to listen to others – and how to be patient with them. Let’s face it, what three-year-old doesn’t need more patience? She’s learning to work on problem solving and persistence. Sometimes it takes Rachel a little bit longer to solve a problem, and sometimes she gets it immediately. She has learned over the years to keep going at it and keep trying, which is absolutely something Abbie needs to learn. Puzzles are one of our family’s favorite things to do, and Rachel is one of the best at them – she keeps going until she figures it out – where a lot of people would just give up. She always has persistence in the face of a problem. She’s learning to have enthusiasm for new ideas. Through all the ideas I’ve had and things I’ve done over the years, Rachel has always been supportive of me. She may ask a lot of questions and wonder why, but she has always trusted me and pushed me – even when she was a kid. 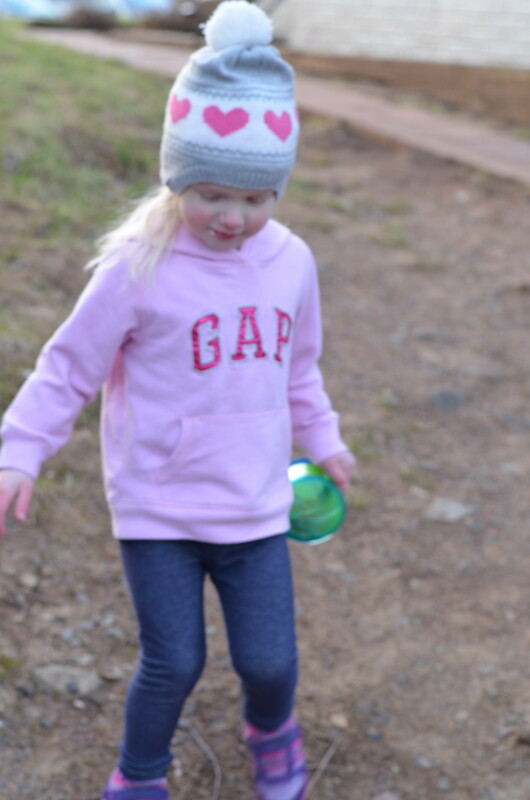 While she has challenges that sometimes hold her back, she pushes me to learn about or try new things. She’s enthusiastic about what I’m doing and wants to know about it. I want Abbie to keep learning and trying new things, always. Best of all, she’s learning that people are different, and that’s an amazing thing. Since the moment my sister was born, she’s been different from anyone else I’ve known, in amazing ways. She gives the best hugs on the planet (seriously, probably the tightest hug you’ll ever get), but only when she’s ready. She loves fiercely and with no regrets. She has a temper and is stubborn, and she sometimes needs some reassurance. Does she have challenges? Sure, we all do – we all struggle in our own ways, but that’s what makes each person different and amazing. Rachel has always opened my eyes to how others see things, to the way people are treated, to the things we have to fight for. She’s different in amazing ways, and I’m so thankful that Abbie gets to grow up with an aunt that gets to teach her that. Abbie’s going to grow up knowing that it’s completely normal to have different strength and abilities. She’s going to know to fight for people that are different. She’s going to know that every single person has value and something to offer the world, but most of all that she’s got one of the best aunts in the world. I couldn’t ask for anything more than that. Very true, and thanks for bringing awareness to autism. We are all different, like you said, and it should be celebrated.